Commercial Architecture has witnessed a significant boost since the advent of the industrial revolution. Though typologically, office space is still defined with expansive floor plates and cubicles, the forms, however, these features have attained and the approach towards office space design has become more user-centric than function-centric. Quality of space is the lead hero of this narrative of commercial space design and a driving factor in outlining the design for such commercial complexes. From incorporating more transparency into the design in terms of both opening up a space in order to maintain a relationship with the outside world to keeping and facilitating spontaneous communication between workers in different departments and disciplines, commercial architecture is now not just about mass production and optimum output. It is more about how the output estimated and the profits can be achieved by providing a suitable working environment for the employees. Designers are the custodians of the built environment whose interventions are necessitated in the name of capacity upgradation. As designers, there is a constant need to emphasize the inclusion of context and conservation in the designs. DFI focuses on this exact principle. Breaking the commercial bulk volumes and analyzing them more like personal spaces to be used by an individual, one would notice the variety, diversity, and intricacy of thoughts involved in creating these complexes. To play-IN into the continuum as opposed to playing OUT an egoistic expression of Disruptivism. To embellish with thoughtful contemporary interventions echoing the aspirations of our times while discarding architectural vestiges. To animate with meaningful newness; combining the use of a problem-solving approach with sensitive and delightful Urban Artistry. To be reverend to the substantive context – both Immediate and Cosmic. To pursue a practice of Architecture with a Conscience- a Karmic Architecture that belongs to its PEOPLE and its PLACE. 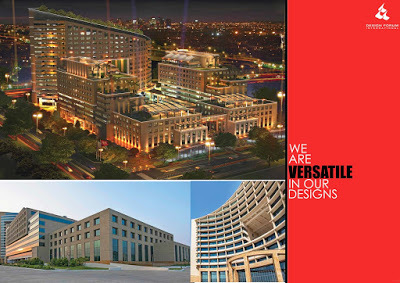 Therefore, going by these philosophies, the commercial projects catered by DFI witness the incorporation of ideas and features like green architecture, incorporation of buffer and communal spaces and materiality consciousness and innovation. Through these projects, one would clearly be able to understand the evolution in thoughts and designs projecting commercial architecture.